Spennymoor is situated just off the A688 between Bishop Auckland and the intersection with the A167 at Thinford. The church is located behind Whitworth Terrace, at the bottom of Edward Street. 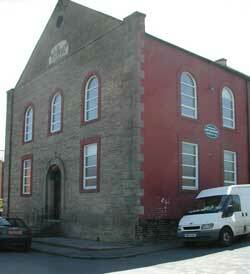 Trinity Methodist Church was a typical Victorian chapel, originally dedicated in1869. It has been extensively renovated (largely by the members) and was rededicated in 1982. The Lightseekers (young people aged 0-16) also meet at 10.30am. Mondays, 10.00 – 11.30am: ‘Once upon a Time’ (adults and children group). Mondays, 2.30 –3.30pm: ‘Oasis’ 1st & 3rd Monday afternoons. Wednesday Morning Fellowship: 10.00am meets in members’ homes. 1st Wednesday in the month:10.30am. Holy Communion at Sycamore Lodge. Wednesdays, 1.30 – 3.30pm: ‘Knit & Natter’. Alternate Wednesdays, 7.00 – 8.30pm: ‘C da unknown’ (young people 11-16). 1st Saturday of the month, 09.30 – 10.00am: Prayer Fellowship. Saturday Coffee Mornings are arranged three times in the year in the Town Hall. The church is a member of Spennymoor Area Churches Together who organise Christmas and Easter Services in local Residential Homes / Sheltered Accommodation.